Our evaluation of alternatives is relative to a neutral reference point, which is sometimes called the “adaptation level.” Outcomes that are better than the reference points are seen as gains, but below the reference points they are seen as losses. The reference point can be the status quo, but not always. A principle of diminishing sensitivity applies to both sensory dimensions and the evaluation of changes of wealth. For example, the subjective difference between $900 and $1,000 is smaller than the difference between $100 and $200. 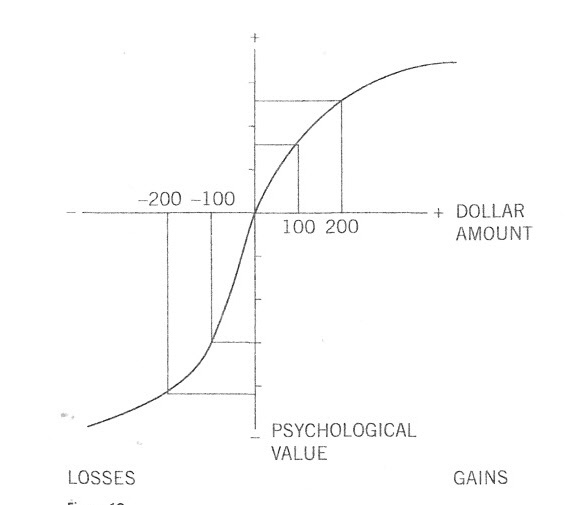 Losses loom larger than gains in our automatic minds. This loss aversion principle may have some evolutionary basis with organisms that treat threats as more urgent than opportunities having a better chance to survive and reproduce. The graph below embodies these principles, and the theory accordingly can be expressed and tested mathematically and experimentally. 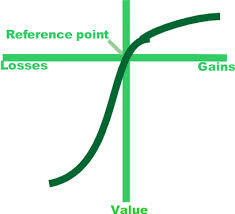 A couple of years after creating prospect theory, Kahneman and Tversky published an account of framing effects, “the large changes of preferences that are sometimes caused by inconsequential variations in the wording of a choice problem.” These framing effects are informative about the “reference points.” Reference points combined with loss aversion are also the issue with the endowment effect. The endowment effect is the tendency for people to pay more to retain something they own than to obtain something owned by someone else—even when there is no cause for attachment, or even if the item was only obtained minutes ago. Kahneman notes in Thinking Fast and Slow that prospect theory has its weaknesses in describing behavior. He notes that it fails to take into account disappointment and regret. However, so far the predictions of a model including disappointment and regret are no better than basic prospect theory. In 1992 Kahneman and Tversky created Cumulative Prospect Theory. The main modification to prospect theory is that, as in rank-dependent expected utility theory, cumulative probabilities are transformed, rather than the probabilities itself. This leads to the overweighting of extreme events which occur with small probability, rather than to an overweighting of all small probability events. This modification helps make CPT an improvement on theoretical grounds over basic prospect theory. In retrospect prospect theory seems obvious, but it was the product of creative and diligent work over an extended period of time. It was created as a model of decision making under risk. Risk suggests that you can create expected probabilities while ambiguity suggests that you cannot. In a May 2013 online version of a paper to appear in the Journal of Risk and Uncertainty, the authors note that prospect theory is the most popular theory for predicting decisions under risk today, but that it also outperforms other theories for predicting decisions under ambiguity. They found that it outperformed subjective expected utility, Choquet expected utility, and three multiple priors theories: maxmin expected utility, maxmax expected utility, and maxmin expected utility. They note that It is convenient that the same function can be used for the whole domain of uncertainty. This facilitates the study of ambiguity (the difference between uncertainty and risk), where prospect theory, unlike most other ambiguity theories today, need not commit to the descriptively failing expected utility for risk. The paper is titled: “An Experimental Test of Prospect Theory for Predicting Choice under Ambiguity” and is authored by Amit Kothiyal, Vitalie Spinu, & Peter P. Wakker. Prospect theory is what is known as a paramorphic model. (Any understanding that I have of this is based on the paper: “Adventures in Paramorphic Modeling: Models of Consumers’ Processing of Negative Information” written by John Lynch.) It is an algebraic model that describes the relationship of observable decision inputs and observable decision outcomes. It is not based on the actual underlying mental processes, and only lately has some physiological data even become available. Predictive success is good, but it does not imply accurate explanation of reality. Thus, over time models that not only accurately predict, but also more accurately explain the underlying physiological reality will evolve. I believe this is underway with such ideas as parallel constraint satisfaction theory, differentiation and consolidation theory, and fuzzy trace theory. I admit to having a difficult comparing such theories and understanding when they can and when they cannot be compared on a one to one basis. This entry was posted in Theory and Models and tagged Kahneman on August 18, 2013 by admin.